The iPad may not have changed the world of computing quite yet, but it is still a pretty nifty device. An e-book reader, a newspaper, an entertainment center and a workstation, this device can do a lot in a very small package. This guide is available to download as a free PDF. Download The Free Guide To Your iPad now. Feel free to copy and share this with your friends and family. 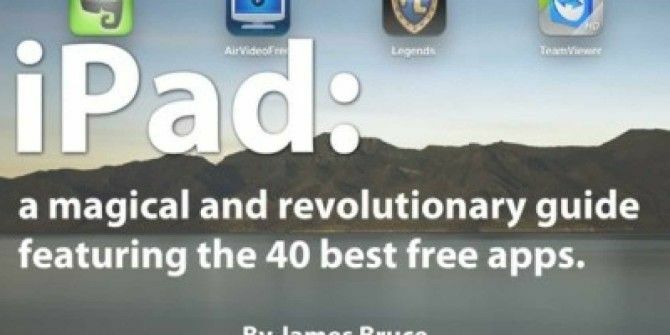 This guide features the 40 best free apps for the iPad, this easy-to-follow guide contains a treasure trove of information that will make using your tablet that much easier. Learn the ins and outs of the market’s premier tablet, for free! If you’re reading this you either already own an iPad or are seriously thinking about getting one (here’s an iPad simulator to help you decide). This guide will help you to get the most out of your shiny new tablet. I’ll show you how to effectively manage your device and keep it organised and tidy. I’ll give you some tips and tricks, and present you with the MakeUseOf app picks for pretty much anything you’d want to do. Some things in this guide you may already know, but I’ve tried to write it with a variety of readers in mind – even experienced iPad owners are sure to find something here they weren’t aware of, or some new apps that will change their usage of the device. There’s something for everyone, so read on and enjoy. If you’re a seasoned iPad pro, you can probably skip this part of the guide. For everyone else, the home screen interface is the best place to start learning about your new iPad. Though we won’t be covering it here, we have covered the Settings screen in detail before, so be sure to read that too if you’re exploring the settings. We will assume default settings for most of this guide, though. Use your iPad regularly for a few months and you’ll no doubt end up with a disorganised mess of applications. Let’s do some sorting. Touch and hold on any icon on the home screen for about 3 seconds and the icons will all start wobbling. In this mode, each icon has an X in the corner, to quickly and easily delete icons from your home screens. Apps deleted like this will still be stored in your iTunes library, so to delete the app entirely do so in iTunes and sync your device. You can also drag the icons around to re-arrange them in this mode – dragging to the edge of the screen will push you onto the next home screen. Remember: You don’t need to stick to the sliding home screen areas – you can add up to 6 of your favourite apps to the main dock area too, or move the existing ones off there if you don’t use them. As of iOS version 4.2 you can drag an application icon on top of another icon in order to create a folder, or drag an application into an existing folder. Of course, you can also rearrange the location of apps within a folder. If you have a lot of apps that you really need one-click access to, just create a folder of essential apps and add that folder to your main dock launch area. The easiest way to manage your apps, however, is through the app tab of the iTunes sync screen. You can read about this more in the iTunes Sync section of this guide. If your home screens are often as disorganised as mine are, and you find yourself with hundreds of apps or a badly organised media library, the easiest way to find something instantly is through the Spotlight search tool. To access it, press the home button and scroll across to the furthest home screen on the left. Just start typing in the file, song, app name, contact or email that you wish to find, and the search results are displayed instantaneously. I often use this search function to quickly launch apps without searching across the home screens, or to find a certain song I’m craving to hear. If you’re running version 4.2 or higher your iPad is equipped for multitasking. When you click an Internet link or a mail link, you will no longer need to shut down whatever app you are running. Instead “quick switch” to the new one. When you are done, you can switch back by pressing the Home button twice quickly to bring up the multitasking menu. The multitask menu can also be used to quickly dim the display or control iPod functionality. Locking the screen orientation of your iPad is essential for reading in bed and lazing on the sofa, but Apple can’t quite decide how to do it. In 3.x versions of iOS, the switch on the side of the iPad – next to the volume rocker – could used to do this quickly and easily. In version 4.2 of iOS, Apple changed the switch so it behaved as a mute button instead, choosing to move the screen rotation lock to a touch button on the multitask menu. Understandably, users were distraught. In version 4.3, you can choose the behaviour of this switch from the Settings screen. Since any typing you do on the iPad is on a small keyboard and with no haptic (touch) feedback, it will take a while to get used to. With the device horizontal, I can now type almost as fast as I can on a regular keyboard. Even so, there are a few tips we can all learn to make typing on the iPad that little bit easier. If you need to type in another language, iOS is remarkably well adapted without the physical limitations of real keyboards. From the settings screen, select General -> International Keyboards. This can be great for studying, and it’s an absolute life-saver in international marriages, let me tell you! Switching between Chinese handwriting, Japanese romaji input system, and plain old English couldn’t be easier. Even if you don’t need to type regularly in a foreign language, the natural handwriting keyboards are great for practising your Kanji if you’re learning Chinese or Japanese, as you need to get the exact stroke order correct for it to be recognised. For most people, the occasional accented letter is more than sufficient. For languages based on the Roman alphabet, just hold down the base letter and variants will appear. The same also applies to quotations and other symbols. Selecting, copying and pasting items on the iPad is somewhat of a black art. Let us guide you on the way to being a copy-paste ninja and save you the frustration. It’s easy when you know how. Triple-tap a block of text to select all of it – this will grab the entire paragraph. Double-tap to select a single word. From here, you can adjust the selection by dragging the blue tags to expand or contact it. To paste, hold your finger on the screen until the magnifying area appears. Carefully drag into the desired position, and simply hit paste. By default there are built in settings for Gmail and Yahoo to easily add your webmail account to your iPad. From the settings screen, select Mail, Contacts, Calendar then Add Account, select the account provider, and fill in your name and password. For some reason, Hotmail isn’t listed by default, but it’s just as easy to add. Choose Other as your account type, then simply select Add Mail Account. You’ll need to fill in the same details, but there are no complicated settings or server addresses. If your password and username were correct, just click save on the next screen and you’re done! 2. Type in your full Google email address for email, as well as the same again for username. 3. Leave the domain field blank, and fill in your password. 4. Press Next. A box labelled Server will magically appear. 6. Select the services you want to sync. The iTunes Sync screen is a remarkably powerful tool that new iPad users tend to overlook. Let me show you all the great things you can do with the iTunes Sync screen to enhance and customise your iPad experience. Not an iTunes fan? Try this iTunes alternative. You actually have a high degree of control over precisely what gets synced onto your device. With the default settings, you often get a little of everything – some music, the latest podcasts, some videos, all of your apps – but with a little micromanagement of the storage area you set your iPad up to be even more useful to you. With your iPad connected and recognised in iTunes, take some time to go through each tab and personalise the content you really want on your iPad. For instance, I like to use my iPad to show family and visitors particular photo albums – so under the photos tab, I’ve set it up to sync the latest X events, plus some favourites like wedding photos and vacations. On the other hand, I have an iPhone to listen to music and audio podcasts, so I’ve completely disabled music syncing. Truth be told, moving a large number of apps around using “wobble” is quite time consuming. The easier way is to plug in your iPad and use the Apps tab of the iTunes Sync screen. Just drag the icons around with your mouse. You can also drag the icons from one screen straight on to another by dragging the icon to the preview of your preferred screen on the right. If you’re having trouble finding which screen you want to put an app onto, just find an app from the screen you’re looking for on the alphabetical list of apps to the left and double click it. iTunes will show you where the app is currently placed. Toward the bottom of the App sync tab there is a section devoted to apps that can exchange files (such as Apple Pages, or various PDF and ebook reader apps). To share a file with that app, simply click on the app name, then drag your files into the box on the right, or select them manually using the Add button. One of the most common uses of the iPad is for watching videos, but it isn’t simply a case of dragging your movie into iTunes. Though there are alternatives we’ll look at later for streaming movies from your computer over WiFi, sometimes you find yourself without WiFi – like on a long haul flight. For this, you’ll need to convert the video beforehand, then import it into iTunes. The best way to do this is with Handbrake, for Mac or Windows. Once you’ve downloaded and installed it, click the Source button to select the original file, then select the iPad preset from the right hand sidebar. Hit the big start button to begin. If you’re working from large HD files, it may take an hour or two to convert a full length movie, so you might want to add it to the queue, find more to convert, then convert the entire queue overnight. With two or three iPad owners on the writing staff, we’ve tested a lot of apps. Here are our personal favourites, with a quick screenshot and summary of what they do, as well as a link to the app store where you can download them. Flipboard: “A personal iPad magazine”, Flipboard is a beautiful way to merge all your news sources. The interface is ground breaking, and it will automatically pull in the Facebook and Twitter news stories, pictures and videos that your friends are posting. You can share, like, or reply from within the app. [iTunes]. Check out the spin-off Surfboard, for browsing webpages in flip-style. Bookman: [iTunes] For comic books and large PDF files that are graphic intensive, Stanza just doesn’t quite cut it. Bookman has a much faster PDF rendering engine, and the thumbnail overview of PDFs is great for quick navigation. If you’d prefer to use Apple’s own iBooks reader, then you can always use these tools to create your own iBooks Two Free Multiplatform Tools To Create iBooks Two Free Multiplatform Tools To Create iBooks Read More to read on your iPad. Kindle: [iTunes] If you’d rather leave your book purchases to Amazon, or are already a Kindle owner, the Kindle app is your only choice. The book selection is also far greater than Apple’s own iBooks, but do consider the new Barnes and Noble app too. If you’re looking for your kids, the Barnes and Noble Nook for Kids might be the answer. Kobo: A curious eBook app that claims to have 1.8 million free books (and not just ancient classics, either) that tries to make reading into a kind of game, with achievements, a personal dashboard, Facebook sharing, and a page full of stats. You can even set up a daily newspaper deliver of your Instapaper clippings [iTunes]. Give it a go, I quite enjoyed it. PlainText: From the makers of Writeroom, PlainText is a simple distraction-free writing app that does exactly what it says on the box. PlainText also syncs with your DropBox to avoid file sharing issues, though this free version is somewhat supported by ads (not particularly intrusive ones, though). [iTunes] If you’re using the iPad as a study tool, be sure to check out these great study aid apps 60 Awesome iPhone & iPad Apps for Students Heading Back to School 60 Awesome iPhone & iPad Apps for Students Heading Back to School If you're heading back to school with an iPhone or iPad, there are a huge number of apps available on the App Store that can help you get work done. Read More too. Evernote: While not strictly a writing-only or blogging app, Evernote is an incredibly competent personal data organiser with options to include audio recording too, and it all syncs with your Evernote account online and on your desktop. It’s not just an app -it’s a whole lifestyle choice, and some would say a religion! Find out more at evernote.com then download the app [iTunes]. Clockwork Notebook: [iTunes] A simple notebook app within which is hidden lots of advanced functionality, including handwritten doodles, sticky notes, and an undo button -all in one free package. If you’re looking for something to jot down ideas this is for you. Bakari also wrote an extensive article on free iPad writing apps 7 Apps That Will Help You Use Your iPad For Writing Projects 7 Apps That Will Help You Use Your iPad For Writing Projects Read More that we didn’t have space to include here, so be sure to read that too. Air Video Free: [iTunes] Though the free version limits the number of files you can view in any one folder, this app is simply amazing. With the movie server software on your PC or Mac setup, you can stream movies directly to the iPad without ever having to care about format issues -it will basically play anything and re-encode on the fly so you can begin watching immediately. Tweetdeck: [No longer available on the iTunes Store] Hands-down the best Twitter client for the iPad and the app of choice for “power tweeters”, the interface is identical to the desktop version and gives you a nice 3-column customizable overview of your latest tweets, direct messages, mentions, or twitter searches. Anyone familiar with the PC app will have no problem. Find more iPad twitter clients Forget Twitter's Official iPhone App: Use These Instead Forget Twitter's Official iPhone App: Use These Instead Now that we've told you why everyone needs Twitter in their lives, here's one more piece of unsolicited advice: don't use the official Twitter app. Read More online here. Gowalla for iPad: [No longer available on the iTunes Store] For social sharing junkies, Gowalla is the ultimate location sharing tool, where you can check-in, tweet and Facebook share it all. It’s great way to discover the highlights of a new town too, and my wife and I make sure to check-in whenever we visit London. FourSquare user? You’re stuck with the ugly iPhone app I’m afraid. Switch to Gowalla! Connect My Mac / PC: For local networks only, Connect My Mac [iTunes] or it’s sister app iRemoteDesktop Free [iTunes] let you view and control your computer without any additional software -though it doesn’t work with the Home edition of Windows 7. It uses built-in Windows and OSX functionality, but check out TeamViewer if you need cross- platform support via the internet. Roambi: If charts and data visualisation are your thing, Roambi will give you visual ecstasies you never thought possible. Just upload an excel file to your free personal online Roambi account, and the data will be transformed into interactive charts and graphs on your iPad. Read more and sign up at Roambi.com [iTunes], and be sure to read our iPad business tools write-up too. Dropbox: Sometimes simply emailing a file to yourself is enough, but for everything else there’s Dropbox. It’s a personal hard drive in the cloud, which syncs with your local computer. While you can’t edit the files, it is simply the easiest way to view basic documents on your iPad – and it supports nearly all the major text, spreadsheet and presentation file formats. [iTunes] and sign- up. Wunderlist HD: This incredible to-do list app has all the features you could want while keeping things basic! Wunderlist is not only beautiful and simply functional, it also syncs automatically with the Wunderlist PC, Mac and iPhone versions so you can keep abreast of what you have to do wherever you are. [iTunes] Read more on this amazing cross platform app in Bakari’s article Wunderlist Syncs Your To-Do Lists Across Windows PC and Mac Wunderlist Syncs Your To-Do Lists Across Windows PC and Mac Read More . While you’re downloading this, there’s another 10 great addictive games here 10 Great Free Games for Your iPad 10 Great Free Games for Your iPad Read More . Game Room: A collection of no less than 8 classic board games for you and a friend, with beautiful graphics that really emulate the feel of the originals. It even includes a custom game mode, where you can design your board size and pieces. [iTunes] Be sure to check out my article on the best iPad board games 11 Free iPad Board Games You Shouldn't Miss 11 Free iPad Board Games You Shouldn't Miss Read More for more classics. For the most part, you shouldn’t have too many problems with the iPad. The most common issues are app crashes, wifi connections, and general slowdown. I’m also going to show a little about how to get the most from your iPad battery – though even with full on usage you should get a good 6-10 hours. Though iPads are often more stable than their iPhone counterparts due to less hardware configurations, Apple cannot test every function of every app that passes through the store. Fortunately, if a bug has been reported and the software updated, then a quick check on the Updates tab of the App store should put things right again. With the advent of multitasking, the multitude of apps left partially running in the background can sometimes cause problems. To close these, double press the Home button, then hold over an app icon to enter wobble mode. Click the red X to close down as app as you would to delete one from the Home screens. If you’re trying to run a complicated 3D game try a complete reset of the device in order to get all the available video memory. Hold down the On/Off Switch and the Home button until the Apple appears to reset the iPad. Early versions of iPad software were known to have lots of wifi issues, so the first thing you should check is if you are running the latest version. Plug your iPad into your computer as you would to sync it, and select Check for Update. If you can, you should see if there’s a firmware update available for your router, though this is beyond the scope of this guide. Refer to your router manual or ISP technical support line to help you with this. Finally, I’ve found that while playing with router settings, certain configurations of passwords and Wifi security levels are incompatible with the iPad. Try lowering or simply changing the security level, or shortening the password. There are 3 things that will deplete your battery life quickly – videos, brightness, and wifi. If you turned off the wifi, didn’t watch any videos, and reduced the screen brightness to its lowest level – your iPad battery would last about a week of regular daily use before it needed charging. At full brightness, with wifi on, and constantly watching videos, you can probably get about 6 solid hours out of it. Batteries do get less effective as they get older, and 100% in a year’s time may mean half as much battery life as it does now – but there are precautions you can take to reduce the aging effects on your battery. 5. Don’t leave the iPad plugged into a sleeping computer, as the battery will drain. By taking these steps you can ensure the battery is fully “cycled” every time and should have minimal loss of battery life. Remember, every time you charge the device it will hold a little less charge, so avoid charging when it isn’t necessary. The success of the iPad lies in the fact that it is precisely what you make of it, and no two people will use their device in exactly the same way. While we can show the best apps for the most common use cases, there are thousands of fantastic but entirely niche apps we couldn’t hope to fit within these pages. For those times, there is the app store. Whatever it is you’re looking for – there’s an app for it (though not all free). I hope we’ve also managed to teach you a few tips and tricks for using the iPad, no matter what your level is. If you can follow our simple battery-saving advice, you should get a good battery life for at least a few years. For the latest iPad tutorials, tips, and free app reviews, make sure to visit MakeUseOf often or subscribe to the RSS feed in your shiny new iPad RSS reader. We have a team of dedicated and knowledgeable iPad owners just waiting to show you the latest cool apps, and we love getting feedback from you – about this guide, or any of the other fantastic MakeUseOf guides available for free download. Thank you for reading, and I hope you get as much enjoyment and use from your iPad as I do.